By law, customers in the European Union have the right to withdraw from the purchase of an item within 14 days from the day after the date the item is delivered. This only applies to unopened items in their original, sealed packaging. Claims for short deliveries (missing products), incomplete or damaged items must be made, in writing via email within 48 hours of delivery. For us to deal with your return you will have to obtain a Returns Number (RMA) and have the return approved by us before you return any item. No item can be returned without first having their RMA approved. Customers must return unwanted goods at their own cost using a 'signed for' courier service. We are unable to exchange items that are not damaged, defective or incorrect after these 14 days, nor if they have been used or removed from their original packaging. Upon inspection the sale will be credited less the initial carriage charge. Please note that returning some items may incur a handling charge depending upon the manufacturer's terms. This may be as much as 25% of the original invoiced amount from some manufacturers. Please carefully check and confirm all specifications before ordering. 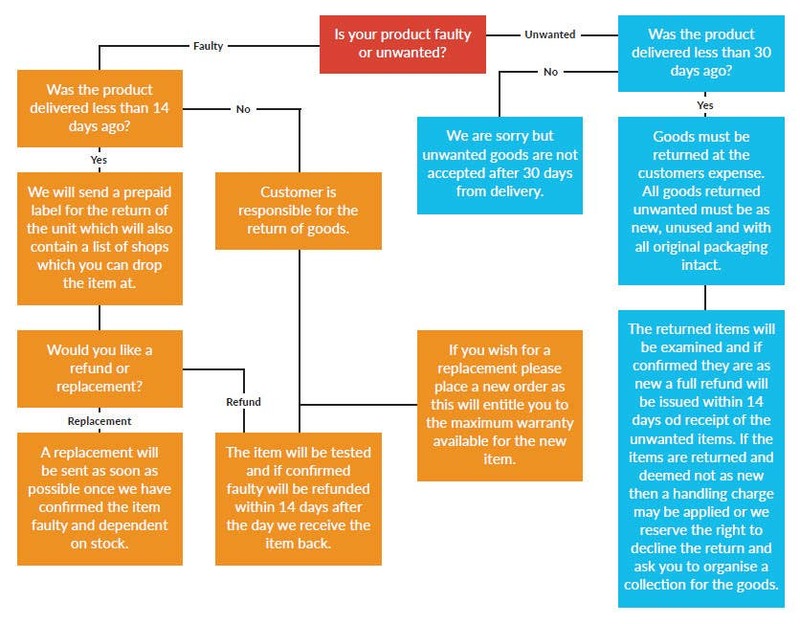 In the unlikely event that a product that you have purchased from electrical2go.co.uk develops a fault please obtain a Returns Number (RMA) and have the return approved by us before you return any item. No item can be returned without first having their RMA approved. Please note customers are responsible for all carriage charges that may apply.